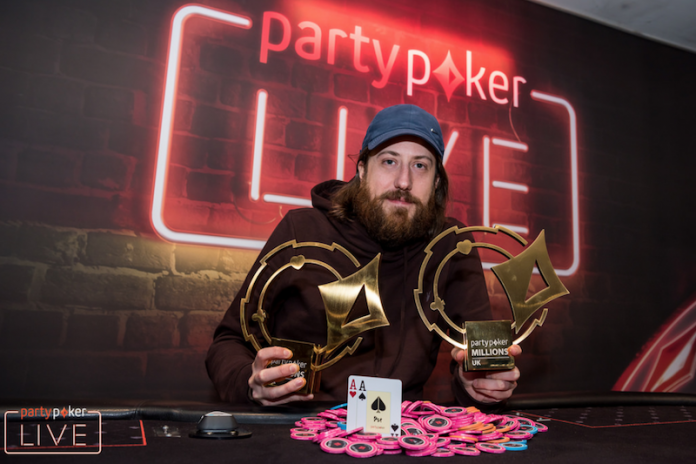 Just days after winning the partypoker LIVE MILLIONS UK £25,000 Super High Roller for £450,000, Steve ‘MrTimCaum’ O’Dwyer won first place in the series’ £10,000 High Roller. In this one, O’Dwyer bested a field of 105 entries and took home a first-place payday of £314,000. The combined haul from the two events saw O’Dwyer win £764,000. The three-day partypoker LIVE MILLIONS UK High Roller began Friday and entering Sunday’s final day of action, 13 remained with O’Dwyer atop them all. Anton Wigg was the first player to bust on the final day, falling in 13th placard putting the tournament on the money bubble. Shortly thereafter, Mustapha Kanit was eliminated at the hands of Dominik Nitsche to send the remaining 11 players into the money. Juan Pardo Dominguez busted first in the money in 11th place, then Adrian Mateos went out 10th. The final nine then joined to one table before Fabrizio ‘SixthSenSe19’ Gonzalez, the players O’Dwyer defeated in heads-up play in the £25,000 Super High Roller, busted in ninth. Anthony Elliott went out to Nitsche in eighth place, Joao Vieira and Chris Brammer busted to Michael Zhang in seventh and sixth places, respectively, and then Zhang went out in fifth. On Zhang’s bust, he ran the into the pocket kings of O’Dwyer and couldn’t pull out the win. O’Dwyer kept his foot on the gas in four-handed play before he knocked out Nitshce in fourth. This time it was pocket aces doing the trick for O’Dwyer, as he sent Nitshce packing with the . In the clash that saw third-place finisher Preben Stokkan hit the rail, O’Dwyer held another big hand — the . He was up against Stokkan’s but turned a king to score the elimination. That left O’Dwyer and Speranza to battle for the £314,000 top prize and the title. Both had already locked up £193,000 in prize money, and O’Dwyer took the lead into the final duel with 69.575 million in chips to Speranza’s 35.45 million. O’Dwyer chipped away early and had Speranza on the ropes with less than 10 big blinds. Eventually, O’Dwyer moved all in and Speranza felt he had no choice but to take a stand. Speranza didn’t have much with the , but things only looked grimmer when O’Dwyer tabled pocket aces once again. Speranza flopped a pair of threes, but it wasn’t enough as the board ran out . The victory was another impressive score for O’Dwyer in 2018, who now has more than $4.5 million in live tournament earnings won on the year. The result was also his ninth six-figure live score of the year. As if his 2018 live tournament results aren’t enough jaw-dropping figures for your next great bar debate, O’Dwyer recently won his first PokerStars World Championship of Online Poker title for $227,101 and took down Event #123 Super High Roller Championship Event: $25,500 No Limit Hold’em in the partypoker POWERFEST series for $896,610. Photo courtesy of My partypoker LIVE.